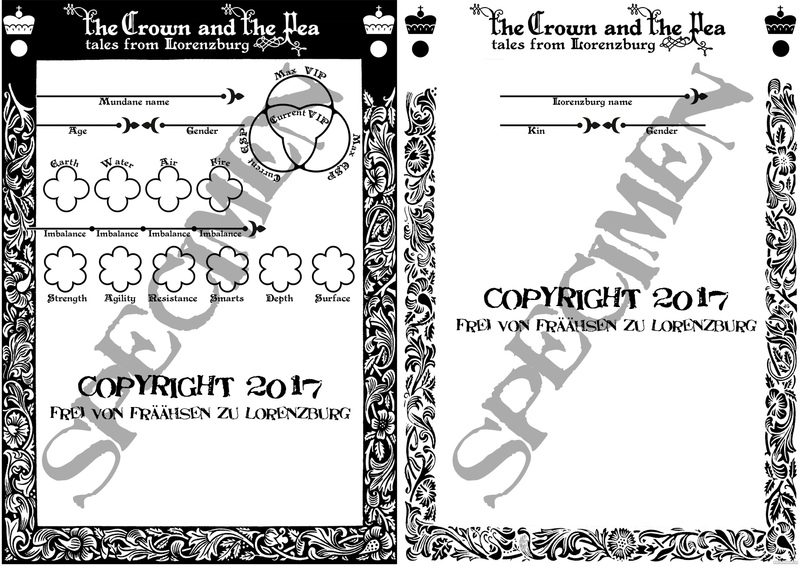 We are pleased to present one of Lorenzburg’s new projects: the Role-playing game The Crown and the Pea that takes place in the fairytale nation of Lorenzburg. The rules will be simple and the ambition is that they shall fit on one double-sided A4 sheet. This is because the emphasis should be on playing, not on learning rules for weeks and weeks. The Most Serene Principality of Lorenzburg is a contemporary miniature fairytale nation. Lorenzburg’s primary symbol is the crowned pea because the nation, much like the pea in the story of “the Princess on the Pea”, has great capacity to inspire positive change in spite of its size. Fairytale realms and people have the one thing in common that they are infinitely larger on the inside than they are on the outside. The mundane environment of Lorenzburg consists of 1.1 square kilometer of woodland, villas and semi-detached houses but the inner and invisible Lorenzburg is vast and unexplored. In the game, the players walk between two worlds where closets can become portals to enchanted places and where suburb basements can hide Black Elf terrorist cells. Legend and reality merge in the borderlands between the everyday and the adventure. Those who are brave, and who see deeply and truly, may move betwixt the worlds, but the have to be careful so that the inner and outer balance isn’t disturbed too much. A nurse, kindergarten kid or a politician may very well become a giant wizard, noble Knightess or thieving Fey in the Most Serene Principality of Lorenzburg. The role-playing game The Crown and the Pea unite, or play out against each other, the players’ inner polarities in the quest for gold, glory and survival! The Crown and the Pea will be available as a download on this webpage when it is finished! Previous Previous post: A Serene Carnival of All Colors!